Events - Beta Sigma Phi Victoria Australia...Life, Learning and Friendship! Our Friendship Day this year was held in conjunction with the August Council meeting at the Port Melbourne Community Room. The theme was "Australia" and everyone was encouraged to wear something Aussie or in the relevant colours. Rae Alexander was our quiz master and we all learned more about our wonderful country's history. As usual, lots of food, catching up with friends and laughter. ​Victoria's 60th Founder's Day Lunch was held on Saturday, May 5th at the William Angliss Institute. A total of 79 members enjoyed an afternoon of friendship, laughs & great food. Marie Matser, was the guest speaker for the day. 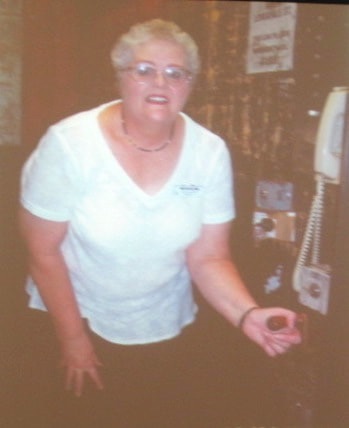 She was one of the last lift drivers at Myer Emporium in the City. As she started her talk we all thought we were actually in her lift. We saw a bit of a slide show showing how the lifts and the buildings have changed over the years. She also talked about the different events and the many different people she met. Beverley Cox, Xi Master was honored with the Golden Circle Ritual in acknowledgment of her 50 years of membership in Beta Sigma Phi. Congratulations Beverley. Thanks to Heather Russell and her Executive – Glenys Welsh, Rae Alexander, Lauris Marsh and Jan Perry – for organising such a lovely day for us. Heather also thanked Cheryl Wallis for her work on Thurunga and Carol Heenan for up-dating the "In Memorium Book" when required. Thanks to the Chef and his staff for an excellent day. And also thanks to Eleanor Holden and Rae Alexander for supplying some of the photos from the day. Wendy Hinde was proclaimed "Girl of the Year" for 2017 at the AGM in November by Council President, Lyn Taylor. Wendy joined Beta Sigma Phi in 1975 whilst she was living overseas. She has has been an outstanding member of Kappa Master Chapter for 42 years and has held all chapter executive positions and participated in the activities of the Chapter’s standing committees. She has represented her chapter and Victoria at several Beta conventions. She has been Chapter Representative at E.S. & Victorian Councils and served as a member of the 2000 and 2016 Melbourne Convention Committees as the Opening & Closing Ritual organiser. She was E.S. Council Vice President in 2002 and President in 2003. She also successfully friendly ventured a chapter in her local area. Wendy thrives on planning social events. She has organised several fund raising events for her chapter and has worked tirelessly at the Bunnings sausage sizzles enabling substantial donations to local organisations. Wendy currently holds the Master degree. She received her Order of the Rose in 1995, the Silver Circle Award in 2000 and her 40th Anniversary pin in 2015. In 1979 a group of members in E.S. Council formed a Drama Festival Committee to provide a performance platform for drama students in Secondary Schools. From 1979 to 1983 Wendy was Chairman of this Committee. In 1984 the Committee joined the Mordialloc Eisteddfod Committee and sponsored the Speech Championship & two ballet awards. The Beta contingent went on to run the Canteen that provided healthy food for the students, families, teachers and adjudicators. Wendy still continues to help during the Eisteddfod season. In 1990 the Canteen raised sufficient money to award a scholarship to the Australian Ballet School, an initiative that continues 27 years later. The wider implications of awarding this scholarship are the fulfilment of the ideals of our sorority to promote and enjoy the Arts, and to honour those members who sadly are no longer with us, but who believed implicitly in these ideals. Wendy is an energetic and enthusiastic member of Beta Sigma Phi. She is a respected and dedicated member of Kappa Master. Wendy is a doer, always ready to take on responsibility and to organise things. She has given the best to our sorority throughout her 42 years of membership. Congratulations, Wendy on being awarded 2017 Girl of the Year. 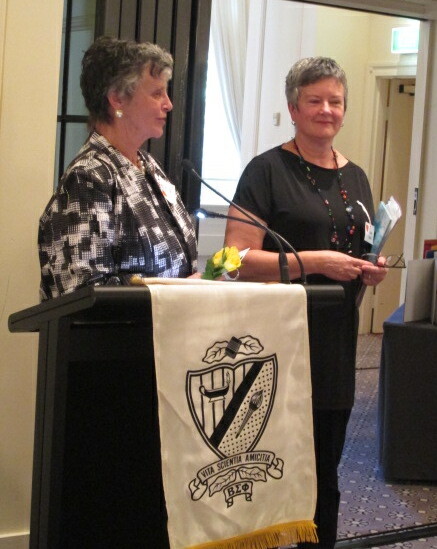 ​Victoria's 59th Founder's Day Lunch was held on Saturday, April 29th at the Vibe Savoy Hotel. A total of 76 members and guests enjoyed an afternoon of friendship, laughs & great food. ​Janene Blanchfield-Brown, President of the National Council of Women was our honored guest. Our Guest Speaker was Judy Dalton, a retired professional Australian tennis player who won nine Grand Slam Doubles Titles. She won at least one women’s doubles title at each Grand Slam tournament, a “Career Grand Slam”. Five of her doubles titles were in partnership with Margaret Court and she won a Mixed Doubles title with Tony Roche. Dalton was a member of the Australian Federation Cup team in 1965, 1966, 1967, 1969 and 1970. Australia won the Federation Cup in 1965 and 1970. Dalton was one of the original “Virginia Slims 9”, the nine players who in 1971 joined the breakaway Virginia Slims tour organised by Gladys Heldman. Dalton retired from tennis at the age of 40, after competing in the 1977 Australian Open. During the 2013 Australian Open she was inducted into the Australian Tennis Hall of Fame. Her bronze bust is on display at the Rod Laver Arena alongside other Australian tennis icons. She is also an Honorary Life Member of Wimbledon. As well as her legendary performances on the court over her career, Dalton is equally well known for her tireless efforts with junior tennis, in particular her work with the Foundation Cup over many years. Tennis Victoria honored her outstanding achievements and contribution to junior tennis by naming the Tennis Victoria 13/u Girls Regional Team Event, The Judy Dalton Cup. Dalton’s stories and insights into the modern day playing conditions compared to her professional days had everyone enthralled. ​Barbara Thompson, Beta Master was honored with the Golden Circle Ritual in acknowledgment of her 50 years of membership in Beta. Elizabeth Grant, Lambda Master received her 40-Year Award. Congratulations to both Barbara & Elizabeth. ​Thanks to Heather Russell and her Committee – Cheryl Wallis, Lauris Marsh, Lyn Taylor and Janet Park – for organising such a lovely day for us. ​Thanks also to Eleanor Holden for supplying some of the photos of the day.